In this drama set in the mid-1950s, Alexi (Balthazar Getty) is a typical teenager who loves rock & roll. Unfortunately, he lives in the U.S.S.R., where rock music is looked at as a degenerate fad of the decadent West. Luckily, Alexi's Uncle Dimitri (Armin Mueller-Stahl) is a music salesman who sometimes travels outside the country; he smuggles in some rare Jerry Lee Lewis and Elvis Presley singles for his nephew, and before long, the aspiring classical musician is ready to rock until the break of dawn. 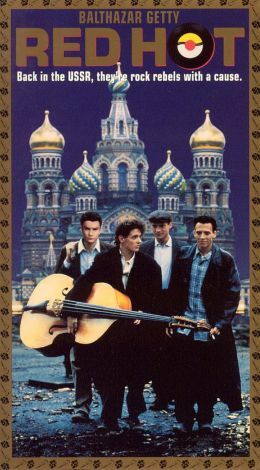 Alexi and his buddies Sasha (Jason Kristofer), Yuri (Hugh O'Conor), and Vlad (Colin Buchanan) dream of becoming the first garage band to play the big beat behind the Iron Curtain, and Sasha begins bootlegging the cream of Alexi's record collection for an eager audience of fellow Soviet hepcats. Alexi also teaches some Jerry Lee and Fats Domino licks to Valentina (Carla Gugino), a pretty girl whom he's tutoring in piano, but her father Kirov (Donald Sutherland) is not at all amused and wants to know how the new scourge of America's youth has made its way into Russia. Red Hot was the feature-film debut for director Paul Haggis, best known for his work on the TV series thirtysomething.